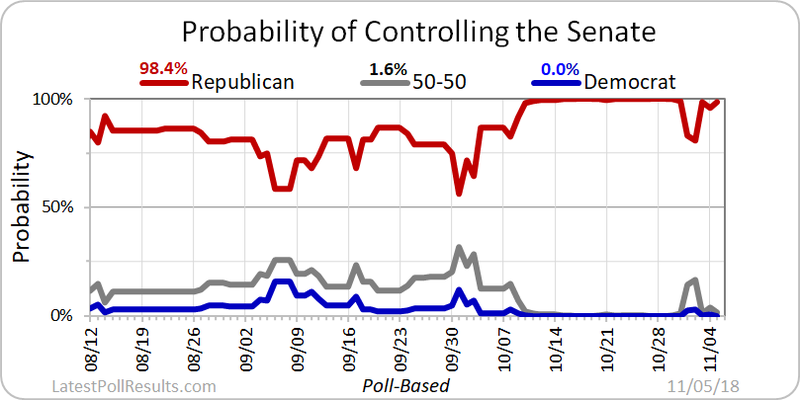 LatestPollResults.com - Statistically-based Probability Analysis of the 2018 Midterm Elections. 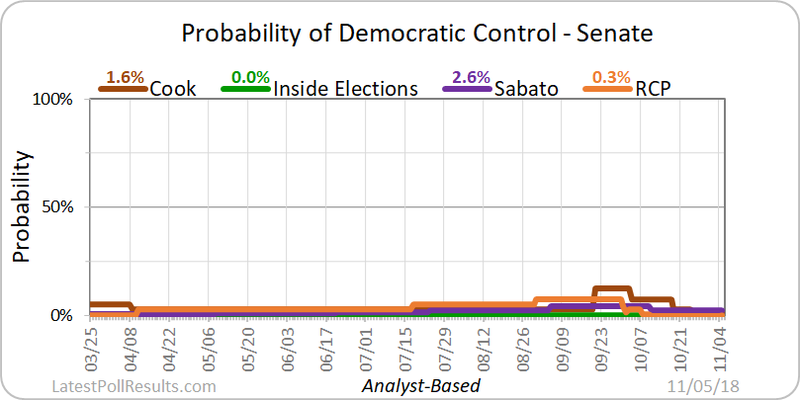 Analyst-based - using qualitative ratings for each race from The Cook Political Report, Inside Elections, Sabato's Crystal Ball, and Real Clear Politics. After the 2016 election, Republicans held a 52-48 edge over Democrats. Currently, Republicans hold a 51-49 edge. This year there are 35 Senate seats which are up for election, 26 will be defended by Democrats and 9 by Republicans; 42 Republicans and 23 Democrats are not up for re-election. With 35 seats, there are 2^35, over 34 billion, possible combinations of outcomes. 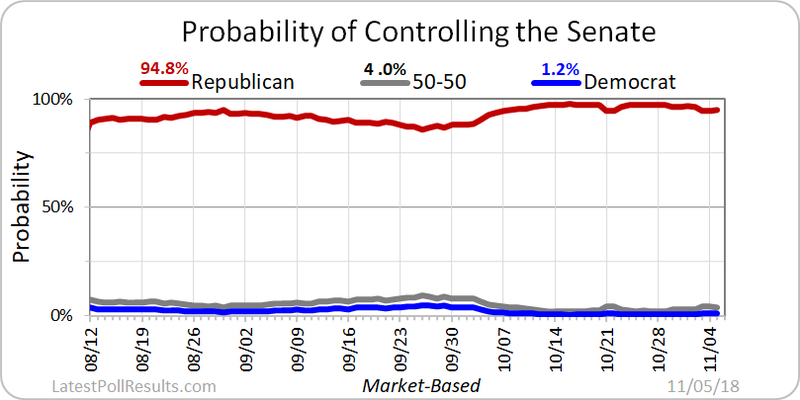 As you can see from the above probabilities, at this time, the odds that the Democrats will win enough seats to take control of the Senate are extremely low. Cook - 10/30: "Democrats are the clear favorites for the majority and appear poised to gain between 25 and 40 seats." Inside Elections - 11/1: "Democratic gain of 25-35 seats, with larger gains possible." 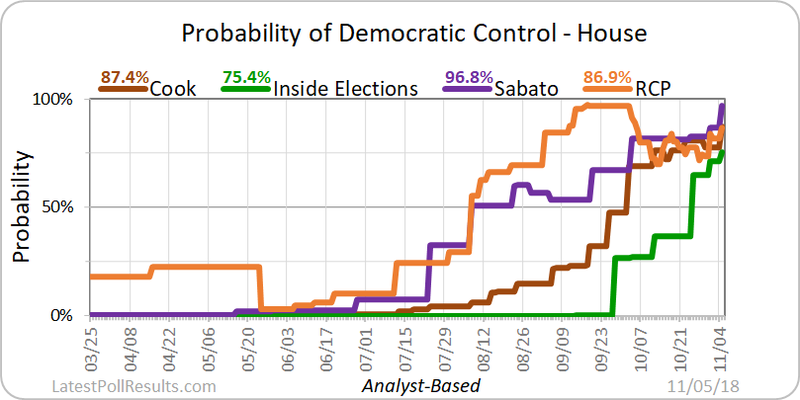 Sabato - 11/1: " ...we're thinking an overall Democratic gain of somewhere around 30 seats, give or take."